A large group of women attended the Invesco Financial Boot Camp for Women on Oct. 20 to gain the tools for financial independence. 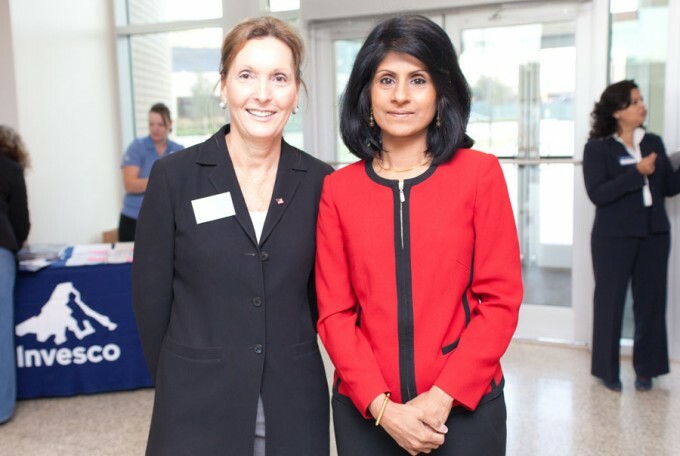 Invesco Divisional Sales Director Janice Cellier, left, and Bauer Dean Latha Ramchand, right, emphasized the importance of being financially independent. Across nearly all segments of the population, lack of financial literacy is a critical challenge to the success of the nation’s economy. For women, in particular, the need for knowledge and opportunity to understand personal finances and financial management for family members is essential. Partnering with Invesco, the C. T. Bauer College of Business sought to tackle the issue with the second annual Invesco Financial Boot Camp for Women, a one-day event to promote financial literacy for women in Houston on Oct. 20. Sponsored by Invesco and hosted by Bauer College at the University of Houston, participants got the opportunity to learn information on investing, budgeting, planning for retirement and college planning. All proceeds of the event will benefit Bauer student scholarships. “We see ourselves as Houston’s business school, and anything we need to do — anything we can do — to sustain that role and be here when the business community needs us, we absolutely need to be doing that,” said Dean Latha Ramchand. For Invesco, events like the Financial Boot Camp are the opportunity to serve the community and spread financial literacy. Partnering with Bauer College to deliver programming, said Invesco Divisional Sales Director Janice Cellier, is a natural fit.